Earthquakes have a tendency to wreak havoc everywhere they arise. Knowing what to do, before a disaster such as this ensues, will ensure that you will be able handle these types of emergencies if they happen to come your way. Nothing catches you off guard quite like the sudden rumble of an earthquake. Without a moment’s notice, these naturally occurring events have the ability to create mass movements in the form of landslides, rock slides, rockfall, liquefaction, and submarine slides. To make matters worse, in many parts of the world, we have watched as earthquakes were the catalyst to destructive tsunamis. Although we haven’t had one here in North America, those who live near the coast should still be aware of the risks. Many have grown concerned about the New Madrid fault line. This is a major zone for seismic activity and a prolific source of intraplate earthquakes in the southern and midwestern United States. 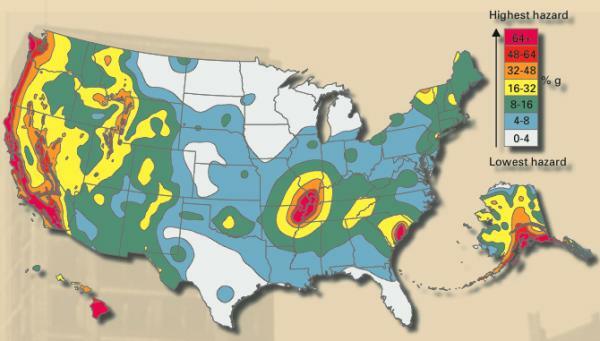 Did you know the largest earthquakes ever felt in the United States were along the New Madrid Fault in Missouri, where a 3-month-long series of quakes from 1811 to 1812 included three quakes larger than a magnitude of 8 on the Richter Scale. These earthquakes were felt over the entire eastern United States (over 2 million square miles), with Missouri, Tennessee, Kentucky, Indiana, Illinois, Ohio, Alabama, Arkansas, and Mississippi experiencing the strongest ground shaking. In fact, the shaking of an estimated 8.8 earthquake was so intense that it caused the Mississippi river to flow backwards, causing a “fluvial tsunami” that covered small islands, capsized boats, and created new lakes where none had previously existed. Although earthquakes give little to no warning, scientists have developed a warning system to alert citizens. Earthquake Early Warning (EEW) uses existing seismic networks to detect earthquakes rapidly and send a warning ahead of destructive seismic waves. Many scientists are warning that we are long overdue for a megaquake in North America. If you live in an earthquake-prone area, there are many things you can do to prepare well before the slightest tremble ever happens. Having the prep work done ahead of time will help you adapt more fluidly to the situation and deal with the turmoil that earthquakes bring. Preparing survival tools, emergency food and water, communication devices, first aid and pre-determined safety zones where family members can meet will help everyone to remain safe and calm. When an unexpected event happens, the immediate reaction from most is confusion. People have no idea what they should do because they are so stunned at the occurrence of the event. Having a disaster plan already in place can help, because family members don’t have to try to figure out what to do – the steps to safety have already been decided. Based on the map provided below, estimate what size earthquakes are likely to occur in your area. Once you’ve determined the likelihood of an earthquake in your area, as well estimating the potential severity, it is important to research local emergency management (American Red Cross, City Disaster Services, etc) systems to know what their disaster protocols are. This will help you learn what to expect during a disaster. Have an emergency plan in place. This will help family members know exactly where to go and what to do. The emergency plan should have a meeting place designated in the event that family members are separated. Additionally, having a central contact outside of the disaster area that can relay messages can help a family reunite if they are separated. Prepare children. Particularly if you live in an area that is prone to earthquakes, discuss the possibility with your children. Kids often freeze up when something unexpected occurs, so spend time teaching them what they should do. The seismologists at the USGS recommend that you drop, cover, and hold on in the event of a quake. Get under something solid so that you lessen the possibility of being struck with a falling object. Teach kids to close their eyes and protect their faces, since debris and glass often fly around during a quake. Look for any hazards in the home. Most earthquake-related injuries result from collapsing walls, flying glass, and falling objects. You can lessen the risk of injuries by securing your home ahead of time. Here are a few tips to get your home earthquake-ready. Place heavy or bulkier items on lower shelves. Cabinets and pantries where breakable items are stores should have latches on them. Additionally, any poisonous material, such as fertilizers or pesticides should be stored in a securely latched area as well. Secure the water heater by strapping it to wall studs. Avoid hanging pictures and heavy mirrors over beds or couches, and keep areas where people tend to congregate free from objects that may become airborne in a quake. Carefully secure any flammable liquids that you may be storing. Fires are very common in the aftermath of an earthquake. After an earthquake, utilities such as water, natural gas, and electricity are frequently disrupted. The American Red Cross recommends at minimum a two-week supply of necessities in preparation for a natural disaster. Focus on shelf stable foods that require little or no fuel for preparation. Make a list of emergency supplies to stock up on. Store at the very least 3 days worth of potable water in plastic containers. You can also freeze water in plastic soda containers. FEMA recommends that a person should have 1-gallon of water per person, and don’t forget your furry and feathered friends. Stockpile a 3 day supply of non-perishable items such as canned goods, dehydrated foods, high energy foods such as granola bars, power bars, trail mix, and cereals. Try and find foods that do not require much water to prepare them. See this 72-hour menu plan for more information. Ensure that certain foods are stored away for family members with special needs. A well stocked medical supply can come in handy if someone has an injury. First aid kits can be assembled at home and include all of the basic first aid items that may be needed. A list of complete first aid items can be found here. Crescent and pipe wrench to turn off gas and water supplies. Some places are safer than others during an earthquake. Remember that ground movement during an earthquake is seldom the direct cause of death or injury. Most earthquake-related casualties result from collapsing walls, flying glass, and falling objects. These important safety tips can help you to quickly get to the best safety zone no matter where you are. Use a doorway for shelter only if it is in close proximity to you and if you know it is a strongly supported, load bearing doorway. If you are outside when an earthquake occurs, try to remain out in the open, away from buildings, trees, telephone and electrical lines. Elevated expressways and bridges should also be avoided. Unless you are in immediate danger, stay where you are. However, move away from buildings, streetlights, utility wires, bridges, or overpasses. Once in the open, stay there until the shaking stops. The greatest danger exists directly outside buildings, at exits, and alongside exterior walls. Many of the 120 fatalities from the 1933 Long Beach earthquake occurred when people ran outside of buildings only to be killed by falling debris from collapsing walls. Stop as quickly as safety permits and stay inside the vehicle. Avoid stopping near or under buildings, trees, overpasses, and utility wires. Protect your head as well as possible in the event that aftershocks cause the debris to shift. The danger isn’t over when the shaking stops. There are many hazards that still exist. You must quickly survey the safety of your environment. Look for electrical hazards like downed lines. Turn off the gas and water to your home. Do not use matches, lighters, camp stoves or barbecues, electrical equipment, appliances until you are sure there are no gas leaks. They may create a spark that could ignite. DO NOT turn on the gas again if you turned it off; let the gas company do it. Repair any defective electrical wiring or leaking gas connections before using those systems again. If there are damages done to the ceiling or foundation, get an expert opinion about any structural defects. Have well water tested before consuming it. In some events, you’ll have to leave your home due to damage caused by the earthquake. If you have to evacuate, having a 72 hour kit or bug out bag ready to go will expedite the process of leaving. Your bag should contain all items necessary to survive for 3 days. When preparing a bag keep the main survival points is mind (water, food, shelter, clothing). Having a separate bug out bag for the vehicle will also come in handy in the event that you are caught on the road during a sudden emergency. 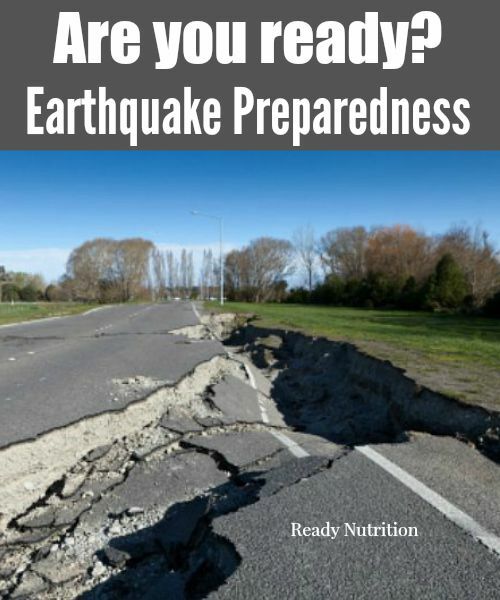 Even though there are parts of the country that less likely to be subject to this type of disaster, the suggested supplies for an earthquake are the same as the supplies for any type of disaster. Having a plan before a disaster can make a big difference in how quickly you will be able to handle these types of emergencies if they happen to come your way. No place is completely immune to the possibility of an earthquake. Learning about what to do in the event that one occurs could save your life. In the Uk we are lucky that out natural disasters are infrequent as not as severe as they a re over in the USA and other countries, however we have no planning whats so ever for them and it would be pure chaos, I think this article proves to be very useful, informative and also highlights to me the basics I dont have prepared if such an event should occur! Thank you! I am happy to hear that my article has stuck a cord with you. If everyone prepared for the potential disasters that hit their areas, there would be less chaos when one does pose a threat. In America, only 7% prepare. That leaves a lot of indivividuals unprepared for a disasterous event. Personally speaking, that is a bit unnerving. With the recent winter storms that came through earlier this month, I am sure that many in the UK had to run out to buy food, water and get extra fire wood in the case they were snowed in. Can you imagine how nice it would have been to have all of those items already in the home? Great info ! I started putting together our prep plan about two years ago after a series of 4+ earthquakes hit the Reno, NV area. Can’t even imagine the devastation a 9.0 would bring. It’s amazing to me how blase’ people are to this hazard, even though we are in major earthquake country. One of the smartest things I’ve done was to sign up for David Morris’ course called “Survive in Place”. Check out “Survive In Place”. com. Just about everything you need to know is in this course, and it is very inexpensive. Keep up the good work. Even the most prepared of us can learn new things to help our community survive a disaster. Tne more you know, the less pressure it will put on our First Responders. God bless us all. Something occurred to me today while listening to the earth quake reports from DC. Although the earthquake was well over 100 miles away the Capitol and White House complexes as well as a bunch of other federal buildings and museums were evacuated and closed. The parking complexes under these buildings were also closed. People working there had only what was on their person, not supplies in their desk drawers or a 72 hour bag in the trunk of their car. Where would you be with just the contents of your pockets or purse? What would you carry daily knowing this could happen? Great question Karen! Last year, I had the same question come into my mind and decided to go full prepper and carry a small survival kit with me everywhere I go. I traded in my fancy purse and invested in a day pack and filled it with a multi tool, survival whistle, hand crank flashlight, head scarf, small first aid kit, pencil and pad, and a few other items. I also carry a bottle of water everywhere I go. It was a little heavy, but I wanted to practice carrying the weight and I had peace of mind knowing that I had some survival tools with me. What items would you all carry around with you?